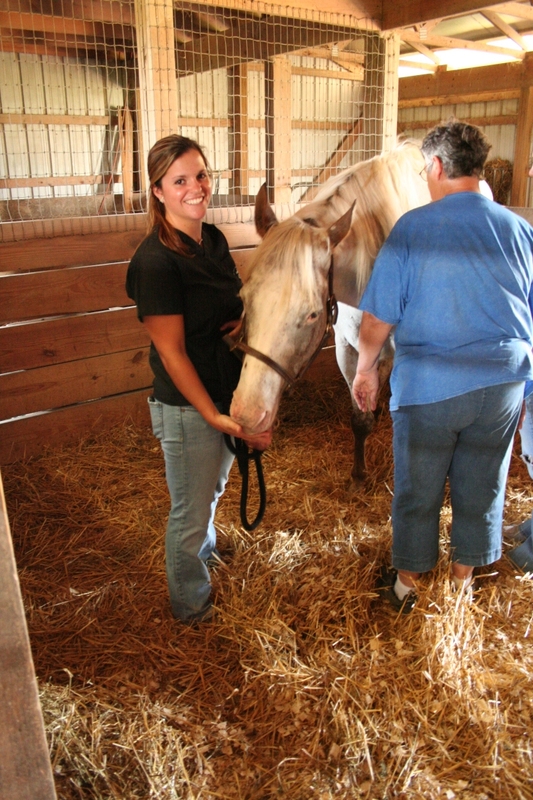 "A barn and the animals within offer unique opportunities for individuals to connect with themselves, derive companionship and comfort from the horses, find new personal strengths, and gain satisfaction from the achievement of new skills," says Coppelman (pictured with one of the horses at Serendipity Stables). If he had “only” inspired fellow physicians to work with those in need, Albert Schweitzer still would have left one heck of a legacy. But Schweitzer’s philosophy of “reverence for life” also laid the groundwork for modern environmentalism (Rachel Carson dedicated Silent Spring to him) and the animal welfare movement (“Until he extends his circle of compassion for all living things, man will not himself find peace,” Schweitzer famously said). Since Schweitzer’s time, science and experience have confirmed many times over the therapeutic potential of interacting with our animal kin—from courthouse dogs who provide vulnerable, victimized children with comfort and calm while they testify, to therapy animals who help veterans cope with PTSD, to equine therapy programs that brighten the lives of children and adults with special needs. Elizabeth Coppelman, a student at The Ohio State University College of Veterinary Medicine and a member of the very first class of Columbus Schweitzer Fellows, is dedicating herself to the latter. 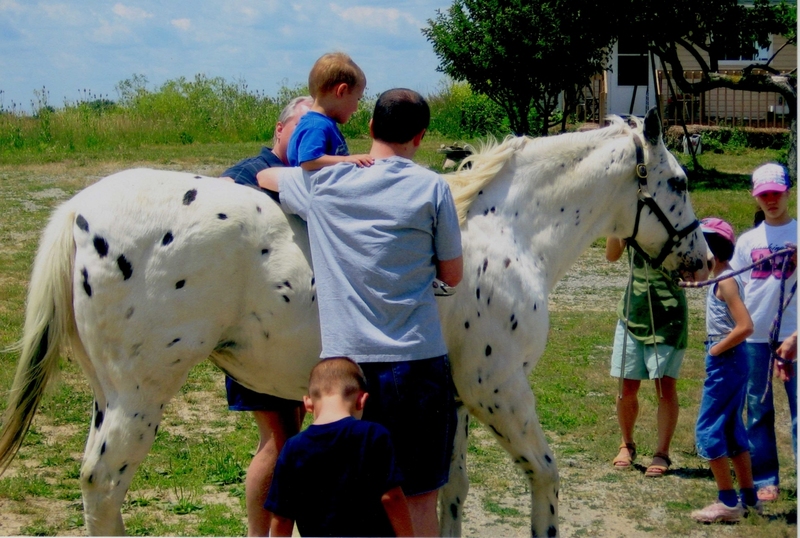 Partnering with Serendipity Stables, she is spending her Fellowship year expanding opportunities for children and adults with mental and physical disabilities to reap the benefits of animal therapy. From the 7th through the 12th grade, I served as a “baseball buddy” for young athletes with a range of disabilities including autism, cerebral palsy, Down’s syndrome, emotional and physical disabilities, and hearing and visual impairments. Many of the children could not speak and exhibited challenging behaviors, but that did not stop them from joining in the fun. Every Saturday we would gather at Simpson Field in Alexandria, Virginia, and spend the next two hours warming up, hitting the ball, running the bases (or wheeling around in a wheelchair! ), catching balls, stealing bases and even achieving a few home runs. The children had a blast. But they were not the only winners. Their parents and grandparents also loved the experience because it was a time-out each week from focusing on all the things their children could not do. Instead, they got to enjoy watching from the stands as their children participated in a normal activity with the assistance of committed “buddies.” I enlisted 20 friends to join the buddy corps, and they came away from each game knowing they had made a difference in a child’s (and family’s) life by simply helping the young athletes play ball. To this day, my “buddy” friends possess an inclusive attitude toward individuals with disabilities that they carry into their chosen professions and communities. But sports aren’t the only vehicle for improving the quality of life for children with special needs. Winston Churchill stated that, “There is something about the outside of a horse that is good for the inside of a man.” A barn and the animals within offer unique opportunities for individuals to connect with themselves, derive companionship and comfort from the horses, find new personal strengths, and gain satisfaction from the achievement of new skills. People with disabilities have fewer opportunities than most to experience such connections and achievements; however, at Serendipity Farms, the staff is committed to just that mission. I began working at a barn at the age of 10 so that I could be around horses. I have put in countless hours hauling hay bales, grooming coats, painting fences, handling horses’ medications, injury rehabilitation programs, special diets , and body clipping needs—during the hottest days of summer and the frozen days of winter—and all those hours are priceless to me. I know that I have the practical knowledge and skills to enhance Serendipity Farm’s program so that more participants can experience an even higher quality of interaction with the horses. 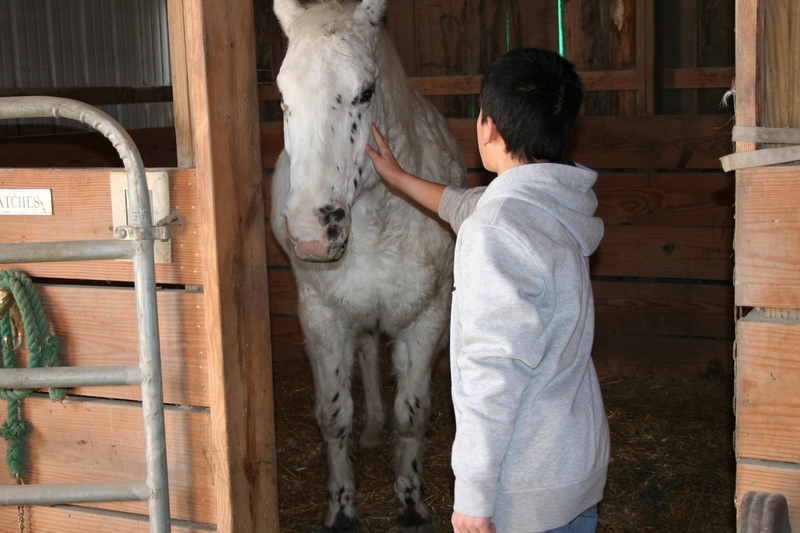 Children interact with horses at Serendipity Stables. It is my goal to develop a volunteer corps and identify potential leadership from the OSU veterinary school that can be renewed yearly to provide Serendipity Stables with ongoing assistance after my Fellowship ends. The Community Outreach Committee members of SCAVMA (Student Chapter of the American Veterinary Medical Association) are committed students who look for opportunities to serve. This could be a very successful long-term fit, benefiting the children and adults who come to Serendipity, as well as the vet students who are able to develop their equine knowledge and skills while simultaneously gaining insight into a public service opportunity through their chosen profession. I believe that collaboration between professionals in animal and human health sectors is crucial for our society to address the major health challenges posed by emerging and re-emerging zoonoses—diseases and infections that are naturally transmitted from non-human animals to humans. Over the past 30 years, 70% of the new infectious agents and diseases affecting humans have been zoonoses. They represent one of the leading causes of illness and death from infectious diseases, and they are of particular concern for at-risk groups such as elderly individuals, pregnant women and immunocompromised individuals. But these diseases are not only causing human deaths, they are also having terrible effects on the people, health care systems, economies, and livelihoods of major parts of the world. For example, look at the recent outbreak in the United States of H1N1, a strain of influenza type A with a mixture of swine, human, and/or avian strains of the virus. When people first heard about the swine flu, they thought the disease could be caught by eating pork. As a result, the pork industry lost millions of dollars and people lost their jobs. Through effective outreach efforts, animal and human scientists were able to convey to the public correct information about the H1N1 influenza outbreak and stem the negative impacts of inaccurate assumptions. It will take multidisciplinary collaboration to increase public and professional awareness of safe practices. For example, people in Europe are now aware of the risk of human infection from contaminated beef that causes bovine spongiform encephalopathy and the new variant Creutzfeldt- Jakob disease. In North America in 1999, public education was critical to understanding the emergence of the West Nile Virus, which is associated with dead birds, especially crows, and can cause deaths in humans. Committed interactions among scientists, government agencies and academic institutions—as well as economics and trade specialists—are vital to the establishment of future of global public health and protection from zoonotic infectious diseases. It is my goal to be a member of an inclusive multidisciplinary team that promotes cooperation and service in the interests of animal and human health. "It is my goal to develop a volunteer corps and identify potential leadership from the OSU veterinary school that can be renewed yearly to provide Serendipity Stables with ongoing assistance after my Fellowship ends," Coppelman says. The most surprising thing about being a Schweitzer Fellow is how quickly I made new friends and laid the foundation of a valuable network that will last for this year and hopefully well beyond. The Columbus Schweitzer Fellows met the first time for a full weekend retreat. We had team building exercises and put together bikes for two deserving children from the local Boys and Girls Club. We also learned about each others’ projects. In two days, I developed a group of friends that I feel I can now call upon when I need ideas for my project or help in general. Recently I helped another Fellow find a pet sitter so she could feel comfortable leaving her pets while she went on vacation! Thanks to the Schweitzer program, my circle of friends has expanded beyond the vet school. I now have contacts in the schools of medicine, nursing, osteopathic medicine, social work, and dentistry. I also know that this is just the beginning! Past Schweitzer Fellows across the country can also be a resource for me. The networking potential that comes with being a Schweitzer Fellow is endless, and I am excited to join a community of highly skilled people from many disciplines trying to make the world a better place. The Schweitzer Fellows Program meshes well with who I am and who I hope to become. In particular, I want to make sure that community service continues to be an important part of my life and career. This value has been instilled in me by my parents. My father has spent his career as a public interest lawyer, and my mother helps parents of handicapped children obtain educational and employment services for their children. I am particularly excited to be joining an ongoing community of like-minded professionals interested in making the world a better place. What an honor it is to be a part of the Schweitzer network of Fellows! I have found encouragement and inspiration from the network. The opportunity to gather with others who are committed to making the world a better place keeps my public service commitment front and center in my life, and allows me to contribute to and learn so much from the synergy of the group brain. Elizabeth Coppelman is a member of the inaugural class of Columbus Schweitzer Fellows. Click here to read more about the Columbus Schweitzer Fellows Program and the Fellows like Coppelman it supports in creating and carrying out yearlong direct service projects that impact the health of vulnerable communities. To make a gift to the Columbus Schweitzer Fellows Program in honor of Coppelman’s efforts to expand opportunities for children and adults with mental and physical disabilities to reap the benefits of animal therapy, click here. Each week, Beyond Boulders delivers a new installment of “Five Questions for a Fellow” – an interview series with Schweitzer Fellows and Fellows for Life (program alumni) across the country and in Gabon, Africa who are leading the movement to eliminate health disparities. For an archive of previous “Five Questions for a Fellow” interviews, click here.